Dimensions: 11.75" x 11" x 1.5"
Pyle's PLVW101W 10" LCD flat panel monitor is the perfect fit for any kitchen, bathroom, or home office, the possibilities are endless! An in-wall mount makes for easy installation. Monitor screen is 640 x 480 high res. 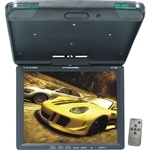 • Brightness: 350cd/m2 • Viewing angle: 40º Up/70º Down/left right 70º • Video input: RCA, VGA • Power supply: DC 12V • Dimensions: (Screen) 11.41" W x 7.48" H x 0.98" D.
The Pyle PLVW line of In-Wall Mounted TFT LCD screens is an excellent low cost solution for constructing and developing scalable security monitoring and video surveillance systems. 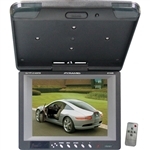 The 15” screen features triple video inputs, two RCA and one VGA, all of which can be connected simultaneously and selected independently using the included wireless or wired remote control. The included screen protector and trim piece is the finishing touch for any in-wall installation, and can easily be modified or customized for your particular application. 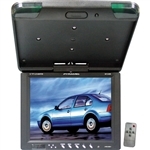 Standard trim accessories and wall treatments can also be used to accent these LCD monitors. The wireless infrared remote control features power, menu, mode, and video input selections, making it easy to control an array of monitors from anywhere in a room. The infrared receiver can be mounted away from the monitor itself, making it even more convenient to control multiple monitors. Their ultra-slim design can be mounted into or on to virtually any wall, for a clean and professional installation.